e-FACT is a system that encompasses the management of complaints, feedback, suggestions,service appreciation and application from UKM staff and students as well as outsiders. The system has integrated the five existing systems in UKM, Sistem Maklum Balas & Aduan ICT (SMAICT), Sistem Maklum Balas & Aduan Kerosakan (SAK), Sistem Maklum Balas & Pertanyaan, Sistem Aduan Dalaman (SAD) and Sistem Aduan Dalaman Pelajar (SADP). The purposes of this system are to improve the service delivery system, systematic complaint management, rapid, transparent and efficient information sharing and generate feedback reports and complaints in a more systematic and flexible approach. 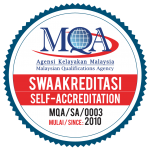 Quality Assurance Center is responsible for monitoring and analyzing the feedback received and to ensure that all complaints are dealt properly and effectively. This complaint and feedback system is intended to identify the problem so that the improvements can be made PROMPTLY for the benefit of students (complainant) and also other students in the next session.